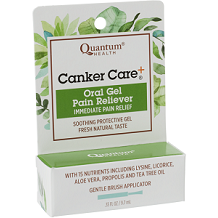 In this article we are taking a closer look at a product called Quantum Health Canker Care. The manufacturer claims that the product is designed to provide natural and immediate pain relief from canker sores. We will assess the reliability of this claim to determine whether you should consider this as an optimal product for relief. The main ingredient in this product is Menthol (5%). Two key ingredients that appear lacking here are; benzocaine which can help to relieve the pain of the canker sores, and salicylic acid for optimal canker sore treatment. Apply to the affected area up to four times a day. Each application provides 5% Menthol. Consult a relevant healthcare provider before using this product. The manufacturer does not elaborate on possible side effects. This is somewhat concerning as individual reaction to the product will vary. You would need to test their tolerance to the product, however, this can only be done after a purchase has been made. You can purchase this product from the manufacturer’s website. A 9.7ml tube costs $8.29. The manufacturer does not offer any additional bulk-buying deals to encourage long-term use of this product. Shipping is free for orders over $29.99. There is a coupon offered on the manufacturer’s website giving you 20% off your next order if you add your name and email address. The manufacturer offers a 30-day money-back guarantee but details are scarce and do not clearly stipulate what condition a product should be in to be eligible for a refund. We found several positive aspects about this product. There is a 30 day return policy. and free shipping for orders over $29.99. There is a coupon offered on the manufacturer’s website giving you 20% off when you add your name and email address. 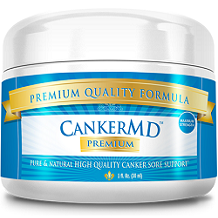 This product may provide temporary relief from pain associated with canker sores. Two key ingredients that appear lacking here are; benzocaine which can help to relieve the pain of the canker sores, and salicylic acid for optimal canker sore treatment. While a guarantee is in place, it is too short at only 30 days, and quite vague and difficult to trust. It is not stated if you can return an opened bottle of the product. The lack of customer reviews to vouch for product efficacy make it difficult to rely on this product. For these reasons, we cannot recommend this product for treating canker sores. We suggest that you seek out a product with a better track record, a longer guarantee, more widespread reviews, and a discounted bulk buying option.